This healthy baked salmon is seasoned with olive oil, garlic, and thyme. Just 12 minutes in the oven and it emerges perfectly baked, moist and tender! The only secret to a perfectly baked salmon is to avoid drying it out. Salmon is so wonderfully flavorful. As long as you don’t overcook it, you’ll emerge from the kitchen with a delectable, tender salmon that everyone is going to love. How long do you bake salmon in the oven? Generally speaking, you should bake 6-oz fillets in a 425 degree F oven for just 12 minutes. Of course, the only way to know for sure that the salmon is ready is to use a thermometer. 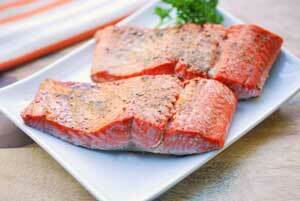 For example, if your salmon fillets are significantly larger than 6 oz, they will need more time in the oven. For perfectly baked salmon, the thermometer should read 135 degrees F (medium-rare). Although keep in mind that the USDA says you should cook it to medium (145 degrees F). If you don’t have a thermometer, check with a fork. The center of each salmon fillet should be opaque and flaky. If it’s still translucent and resists being flaked with a fork, it’s not done yet. Can I bake salmon from frozen? Yes. Simply increase the baking time to about 20 minutes for 6-oz fillets. In fact, baking fish from frozen often helps avoid drying them out. However, you should only do this with smaller, 6-oz salmon fillets. Bigger fillets will likely be undercooked in the middle if you cook them from frozen. And when cooking from frozen, it’s especially important to check doneness with an instant-read thermometer or to use a fork to make sure the center is opaque and flaky. Should I bake a large salmon fillet or cut it into pieces? For even cooking, it’s best to cut a big chunk of salmon into individual, 6-oz portions before baking. It IS possible to bake a large piece of salmon, but then you do run the risk of the edges becoming overcooked while the middle is still raw. So I prefer to use smaller pieces. Should I use wild salmon, or is farmed salmon OK? This is completely a matter of personal preference! I love salmon skin. In fact, I enjoy the skin on all fish as long as it’s crispy. So I tend to prefer skin-on salmon fillets. But the recipe is the same whether the salmon has skin or is skinless. What sauce goes with baked salmon? I don’t usually serve baked salmon with a sauce. Unlike poached salmon, that has a very mild flavor and can benefit from the addition of sauce, baked salmon is very flavorful on its own, especially when baked with the skin on. Rarely, when I make steamed asparagus or roasted asparagus to go with the salmon, I make hollandaise sauce to drizzle on both. What side dishes to serve with baked salmon? Anything, really! A few of my favorite side dishes to serve with baked salmon are balsamic green beans, broiled tomatoes, and zucchini gratin. The side dish you see in the photos on this page is spinach stuffed portobello mushrooms. Theoretically, you can keep leftover salmon in the fridge, in an airtight container, for up to 3 days. But I actually try not to have leftovers when making baked salmon. It tends to dry out in the fridge, and especially when reheated. When I end up with leftovers despite my best intentions, I flake them and use them cold as a salad topping the next day. I think it’s better than trying to reheat the leftovers. But if you prefer to reheat leftover salmon, do so very gently. Cover the salmon pieces and reheat them in the microwave on 50% power, turning often, until heated through. I love salmon and make it often. Baked salmon is probably one of the easiest ways to make it. 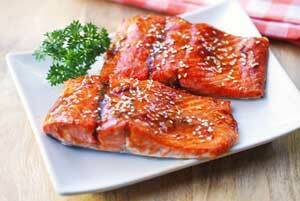 But I also have excellent recipes for broiled salmon, teriyaki salmon, and paprika salmon. Each of them has its own unique flavor, but all of them are very good. And since I make salmon so often, it’s nice to have variety. This healthy baked salmon is seasoned with olive oil, garlic and thyme. Just 12 minutes in the oven and it emerges perfectly baked, tender and flavorful! Preheat the oven to 425 degrees F. Position a rack in the middle of the oven. Line a baking dish with parchment paper. Run your finger across the salmon fillets to check for bones. If your fish have bones in them, remove the bones with fish bone tweezers (I found mine on Amazon). Brush the salmon fillets all over with the olive oil. Arrange them on the baking dish, skin side down. Sprinkle with the kosher salt, black pepper, garlic powder, and thyme. Bake the salmon until opaque and cooked through, and internal temperature reaches 135 degrees F. Depending on your oven, this should take about 12-15 minutes. Serve immediately. Consuming undercooked fish may increase your risk of foodborne illness. The USDA recommends cooking fish to 145°F.